Bright Festive Elf Custom Name Badge. This fun name badge is bright green, red and blue. You can see two legs with stripy tights and funny elf shoes. This 25mm pin badge can be personalised with any name you like. It has a really fun, festive elf design, so if you know any budding Santa's Little Helpers then this badge would be ideal for them this Christmas. It is fab for Christmas parties, schools or Xmas events. 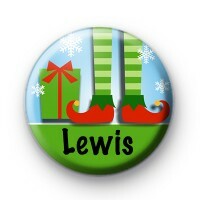 We also have custom Father Christmas and Rudolph name badges too. All our badges are handmade in the UK by us.